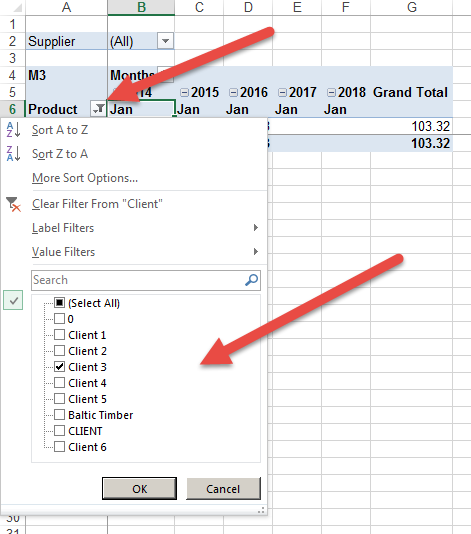 If you work regularly with Pivot Tables, you may have times when you are asked why is the Pivot Table dropdown field list missing. Has it disappeared? This can be very annoying especially when you know that there are other options you may want to choose, yet you can’t choose them, you are stuck on one option. As per below, we know that there are other clients we want to view but for some reason there is no way to change this. The field list dropdown is missing. Similarly with the months. We can see January but how do we change it to February? switch the Field Headers back on. You will notice that the field list dropdown buttons reappear as shown below. Now you can click on the dropdown button and choose the client you want to report on (as below). Similarly with the months, you now have the drop down list.